WINSTON-SALEM, N.C. — Clemson overcame an eight-point halftime deficit and scored 56 points after intermission, most in any half in 185 games under coach Brad Brownell, on its way to a 76-62 win at Wake Forest on Tuesday. The win improved the Tigers to 14-8 overall, 7-3 in the ACC. Wake Forest fell to 10-12 overall, 1-9 in league play. Jaron Blossomgame continued his tear, amassing a double-double with 22 points and 13 rebounds. He now has five straight ACC games with at least 20 points, most by a Tiger since Horace Grant did it in 1986-87. Jordan Roper, Avry Holmes and Donte Grantham sparked the impressive showing in the second half. Holmes scored 17, Roper 16 and Grantham 15 as the Tigers relentlessly attacked the rim after halftime. Clemson overcame a poor start and made 55 percent of its field goal attempts and was 21-23 from the free throw line after the break. The Tigers also owned the glass, going +8 in the final 20 minutes against the Demon Deacons. The turnover miscues from Saturday’s game at Florida State seemed to follow the Tigers early on, as Clemson committed six in the game’s first 14 minutes. As a result, Clemson struggled to extend the lead. Grantham hit three free throws to keep the Deacons at bay, but Dinos Mitoglou tied the game at 18 with a corner three-pointer with five minutes to play. From there, Wake extended its cushion to 28-20 at halftime as Clemson made just one field goal after a Sidy Djitte hook shot with 11:24 to play. The Tigers were just 1-10 from three and had nine turnovers in the opening half. Clemson scored the first 11 after intermission, and took its first lead since early in the ballgame. The Tigers would stretch the lead to as much as 48-40 on a jumper from Roper. But Wake answered with seven straight, closing the gap to a single point. 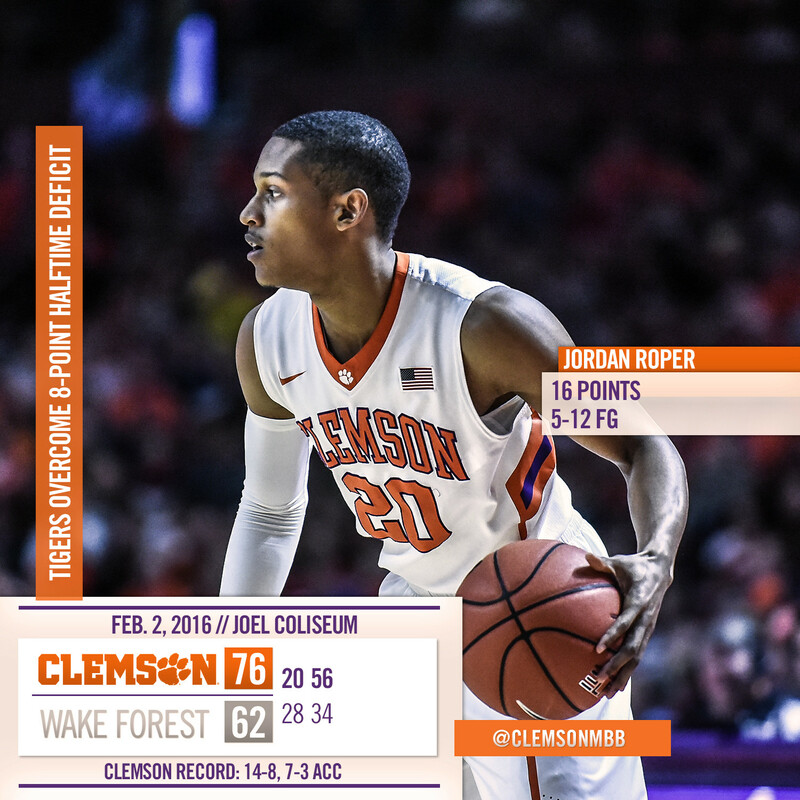 Clemson’s answer back was emphatic, with Roper and Grantham putting together slams in consecutive trips. After that, the Deacs never threatened again as Clemson salted the game away at the line in the final five minutes. The Tigers finish their three-game road trip with a battle at Virginia Tech on Saturday. Clemson squares off with the Hokies at 4 p.m. in Cassell Coliseum.